I don't know about you, but I'm pretty pumped for the Summer. For the most part I'm excited because we normally host two big barbecues where we invite the family and the kids friends to celebrate their birthdays. My son's birthday is in July and my daughter's birthday is in August, which is perfect because for the most part the weather has always been great and we always get a good turn out. I love that my kiddos are both Summer babies. They get that option to either have an outdoor or inside party. One of the things I'm excited about for the birthday/barbecue parties is the games that I have in mind for them. I've been looking up tons of Summer outdoor games and found a lot of them via Pinterest. If you haven't been on Pinterest yet I really suggest you do. There's everything from food and drinks to crafts and great Summer fun activities that will certainly come in handy. One of the games I found that I absolutely love is the outdoor/outside twister. I was so excited when I found out about it and decided to give it a go over the Victoria Day long weekend last month. My in laws have been hosting their annual Victoria Day Weekend Camp Out for the last four years. It's a great tradition that our entire family looks forward to every year. My sister in laws and their families along with my family set up tent in my in law's backyard for the weekend and we play games, eat delicious food and have lots of laughs as we enjoy one another's company. 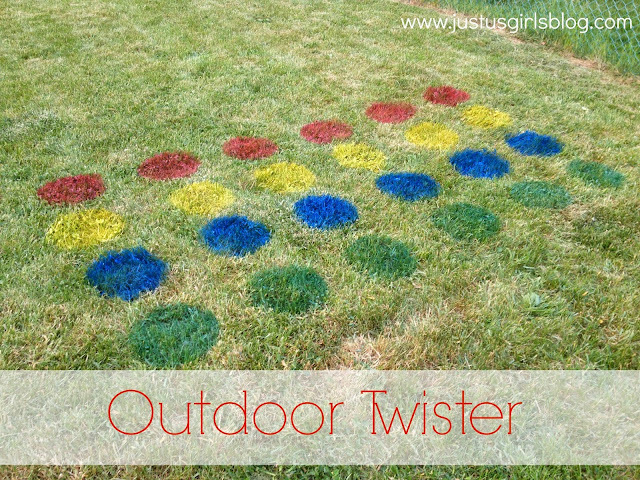 Anyways to get back to this post, I shared with my mother in law about outdoor twister and she loved the idea. We all had a blast playing, especially the kids. It's very easy to do and took us no time to set up. Put your pot in the middle of the inside of your box. Trace the circle and remove the pot. Take your craft knife or scissors and cut out the circle. Remove the circle you cut out and throw it away. Now you have your stencil to work with. Start with red spray paint in the area you want the twister game to be. Spray six circles down and move on to the next row with the next color. Repeat until the game is complete. There should be four rows (one of each color) with six circles in them.